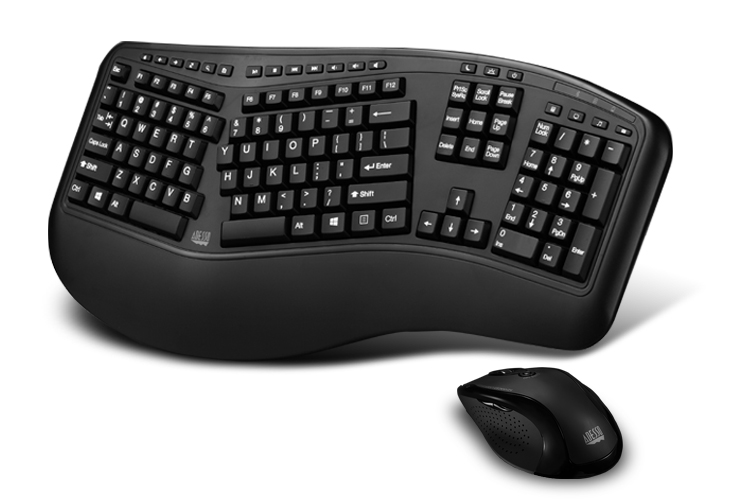 The Adesso Tru-Form Media 1500 Wireless Ergonomic Keyboard & Mouse offer users two advanced input devices with ergonomic design, multifuctional features and a wireless range of up to 30 feet. The design of this keyboard with splitted key zones and gently sloped shape encourages natural position of hands, wrists, and forearm in maximum comfort for long use. The included wireless laser mouse not just provides comfortable ergonomic design but also equips with a DPI switch for changing resolution (800/ 1200/ 1600) and two Internet navigation buttons. With 2.4GHz RF wireless technology you can enjoy working at any angle and at distance of up to 30 ft.
Get instant access to your commonly used Internet and multimedia tools with the 20 built-in hotkeys this keyboard has to offer. Use the battery saving on/off power switch on the base of device to extend battery life and reduce the need to change batteries. Quickly and easily adjust mouse DPI resolution (800/ 1200/ 1600) for a faster response with the convenient DPI Switch located at the top of mouse. This mouse also includes two convenient side internet forward & back buttons for quick Internet navigation. This mouse’s ergonomic design provides a smooth, accurate and comfortable feel, preventing hand strain after multiple hours of use.